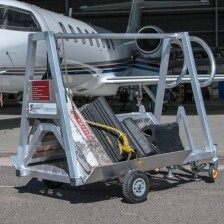 This customized servicing platform was originally conceived as part of a suite of portable access products for Airbus A350 aircraft. 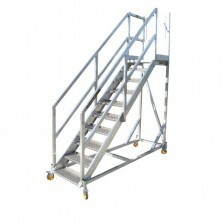 Made from high-tensile aluminum, this weather-resistant platform is easily wheeled in seconds to the front landing gear and secured into place via braked castors. Technicians have safe access to the center of the strut, as well as closer to the wheel well, thanks to removable steps on the front of the top deck.